Rhine River boat s653roes-rhst, length 44,40 m, width 9,20 m, with departure in Assmannshausen, St. Goar and St. Goarshausen on the Rhine River. Approved up to 600 people. Up to 386 seats below deck. round cruise boat ticket(s) for adults and children from 15 years offer no. RIF0806roes together with dinner per person 93 EUR. There is a 19% added value tax included in the boat ticket price. Price change because of tax increase, diesel price increase, increase of the firework fee etc. possible until 4 months prior to the boat cruise date. If there is a price increase you have the right to cancel the boat tickets free of charge. Saturday, August 10, 2019, Spay, Braubach, Rhens, Lahnstein and Koblenz / Coblence. 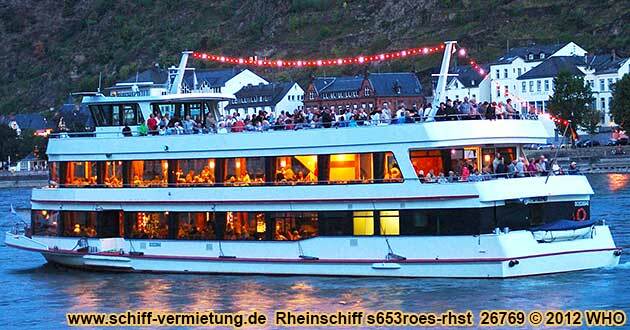 Boat cruise to Rhine in Flames / Rhine Aflame - the mega night on the Rhine river with round trip. Big firework with colorful program in the Rhine river and Moselle / Mosel river grounds from Koblenz / Coblence as well as events in Spay, Braubach, Rhens and Lahnstein. Embarkation in Rudesheim on the Rhine River (right Rhine River side) from 4:35 p.m., departure 4:45 p.m. The passenger boat gathers together with the other passenger boats to the boat parade in the Boppard Hamm and drives together with these along the lights und fireworks Rhine in Flames / Rhine Aflame near Spay (left), Braubach below the castle Marksburg (right), Rhens (left), Lahnstein (right) to the big firework display near Koblenz / Coblence from the fortress Ehrenbreitstein. Seating place below deck on a passenger boat, on board music from the CD player. No dance floor. The firework displays can be seen from the open air deck or upper deck. Disembarkation only possilble in St. Goarshausen about 2:00 a.m., from there return to Rudesheim with own car. No disembarkation possible in Koblenz / Coblence. Departure in Bingen on the Rhine River (left Rhine River side) 5:15 p.m. The passenger boat gathers together with the other passenger boats to the boat parade in the Boppard Hamm and drives together with these along the lights und fireworks Rhine in Flames / Rhine Aflame near Spay (left), Braubach below the castle Marksburg (right), Rhens (left), Lahnstein (right) to the big firework display near Koblenz / Coblence from the fortress Ehrenbreitstein. Seating place below deck on a passenger boat, on board music from the CD player. No dance floor. The firework displays can be seen from the open air deck or upper deck. Disembarkation only possilble in St. Goar about 2:00 a.m., from there return to Bingen with own car. No disembarkation possible in Koblenz / Coblence. Departure in Assmannshausen on the Rhine River (right Rhine River side) 5:30 p.m. The passenger boat gathers together with the other passenger boats to the boat parade in the Boppard Hamm and drives together with these along the lights und fireworks Rhine in Flames / Rhine Aflame near Spay (left), Braubach below the castle Marksburg (right), Rhens (left), Lahnstein (right) to the big firework display near Koblenz / Coblence from the fortress Ehrenbreitstein. Seating place below deck on a passenger boat, on board music from the CD player. No dance floor. The firework displays can be seen from the open air deck or upper deck. Disembarkation only possilble in St. Goarshausen about 2:00 a.m., from there return to Assmannshausen with own car. No disembarkation possible in Koblenz / Coblence. Departure in St. Goar on the Rhine River (left Rhine River side) 7:20 p.m. The passenger boat gathers together with the other passenger boats to the boat parade in the Boppard Hamm and drives together with these along the lights und fireworks Rhine in Flames / Rhine Aflame near Spay (left), Braubach below the castle Marksburg (right), Rhens (left), Lahnstein (right) to the big firework display near Koblenz / Coblence from the fortress Ehrenbreitstein. Seating place below deck on a passenger boat, on board music from the CD player. The firework displays can be seen from the open air deck or upper deck. Return in St. Goar about 2:00 a.m. No disembarkation possible in Koblenz / Coblence. Departure in St. Goarshausen on the Rhine River (right Rhine River side) 7:45 p.m. The passenger boat gathers together with the other passenger boats to the boat parade in the Boppard Hamm and drives together with these along the lights und fireworks Rhine in Flames / Rhine Aflame near Spay (left), Braubach below the castle Marksburg (right), Rhens (left), Lahnstein (right) to the big firework display near Koblenz / Coblence from the fortress Ehrenbreitstein. Seating place below deck on a passenger boat, on board music from the CD player. The firework displays can be seen from the open air deck or upper deck. Return in St. Goarshausen about 2:00 a.m. No disembarkation possible in Koblenz / Coblence. boat tickets for children from 10 to 14 years with own seating place offer no. RIF0806roes, together with dinner per child 90 EUR. boat tickets for children until 9 years with own seating place offer no. RIF0806roes, together with dinner per child 87 EUR. Giving of the boat tickets only together with dinner. Advanced meal order necessary. On this boat, you can only choose between the below mentioned meals. No other meals are offered during the firework events on this boat. The boat line doesn't accept ticket reservation(s) without selection of a meal. If you don't choose a meal, we assume that you wish the first meal "board platter" and will reserve "board platter" for you. The later change of the meal reservation by groups with less than 15 people is liable and is to be paid by the customer. The later change of the meal reservation by groups with 15 or more people is liable and only has to be paid by the customer after a bill has been issued. Drinks will be added and payed separately on the boat. The bringing of own meals and drinks isn't allowed. All reserved seats below deck are non-smoking seats. Smokers are requested to take the open-air deck for smoking. Our group is in case requested 20 years 25 years 30 years 35 years 40 years 45 years 50 years 55 years 60 years 65 years 70 years 75 years 80 years in average. In case our group doesn't completely fill one whole table alone, we would like to sit at a table with people of about the same age. This is only a wish and is by no means a condition. Detailed information about the boat landing stage you will see at the boat ticket, which you can print out by yourself about 5 to 8 days prior to the boat cruise date. Table arrangement as well as service and delivery fee, independent from the amount of the ordered round cruise boat tickets per job for a one-time payment of 5 EUR. 1. Payment per credit card. 2. Payment per bank transfer (only possible if you have a German bank account in Germany).